Even if you’re an expert at finding those awesome $x.97 clearance deals (like the Insteon Home Control Starter Kit for $29.97) like we are, if you’re like most Costco customers, it seems almost impossible to get out of the store without dropping at least a Benjamin on their tempting wares. (You didn’t know you needed that 5-lb. tub of Nestle Toll House chocolate chip cookie dough until you walked by the refrigerated cases, did you?) In fact, according to Investopedia, Costco shoppers spend nearly 150% more per shopping trip than at the average retailer. If you make the pilgrimage to Costco a couple times a month, it’s not inconceivable that you’ll spend at least $230 per month. Some families of 4 or more easily spend that much per trip. So why is that $230 number important? 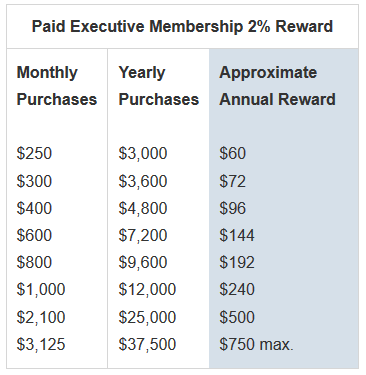 As you probably know, Executive Members earn 2% back on almost all Costco purchases* so $230 is the amount you would have to spend per month ($2750 annually) to earn back the $55 extra you would pay to become an Executive Member. So if you spend more than that per month, say $300, then you’d earn back $72 – which covers the full $55 you paid for Executive status and reduces the annual Gold membership fee of $55 by $18 – bringing your net annual membership fee down to $37. Now, if you’re a large family, have very little self-control (remember that cookie dough? ), and/or regularly buy snacks or supplies for your business like we do, you can easily find yourself spending over $460 per month ($5500 per year) on average. 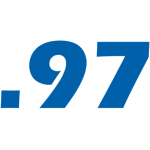 This is the magic spending number that effectively reduces your annual membership fee to $0. At $5500 in spending, you’d earn a $110 rebate, which is the total you pay annually to become an Executive member. Anything you spend over that means that Costco is essentially paying you to be a member. How cool is that?! So you’re probably asking yourself by now, what happens if you don’t spend enough to earn back at least the $55 that you paid to become an Executive member? Seems like you’d be losing money and it wouldn’t be worth the gamble, right? We’re happy to report you’d be dead wrong! Why? Because Costco will refund the difference if you ask them. Say what? Yup, you heard us right. A lot of people don’t know that Costco will refund you the difference between the $55 you paid to be an Executive member and what you actually earned back. For example, if you only spent $2000 during the year and thus earned a $40 rebate, Costco will refund the $15 difference. But remember, you have to ask! They don’t give to you automatically. Just go to the customer service desk and request the difference. You would likely have to downgrade your membership back to Gold, though – so you’ll have to decide if you really want to forgo the other benefits of Executive status. Speaking of other benefits, what makes Executive membership even more amazing, is that Executive Members get all sorts of extra perks & special deals not available to regular (Gold) members. You could save extra on dental insurance, check printing, identity theft protection, free roadside assistance, travel, and more. This could add up to hundreds of dollars annually. In fact, this month Executive members get $60 off installation of a set of four Michelin tires. This alone makes it way worth the $55 extra for Executive status if you plan on purchasing tires, even if you didn’t earn a dime back from your spending. So if you’re not already an Executive member, what are you waiting for??? What’s completely baffling to us is that Costco reports that only 34% of its members are Executive members. In light of all the above, we feel it should be 100%! What’s in your wallet? *The not so fine print: There is a maximum rebate of $750 per year. The rebate check is sent with your annual renewal notice and you don’t have to spend it at Costco – you can use it to pay for more goodies necessary household items or request cash for it at any register. Some items are excluded from earning the rebate. According to Costco.com as of 11/12/2016, in the U.S., Rewards are not calculated: (i) on purchases of cigarettes or tobacco-related products, gasoline, Costco Cash Cards, postage stamps, alcoholic beverages in certain states (including Alabama, Connecticut, Georgia, Kentucky, Michigan, Ohio, and Tennessee), and at food courts; (ii) on membership fees; (iii) on purchases not recorded through Costco’s front-end registers and transactions done on or through websites not hosted by Costco even if accessed through Costco.com, including all business, consumer, and insurance services, the online photo center, Costco Travel, and the My Publisher website; (iv) on miscellaneous fees, deposits and taxes, including sales tax; (v) where prohibited by law or regulation; (vi) on purchases made by anyone other than the account’s primary or primary Household Cardholder; and (vii) on certain other categories as determined at Costco’s discretion, which may change without notice.